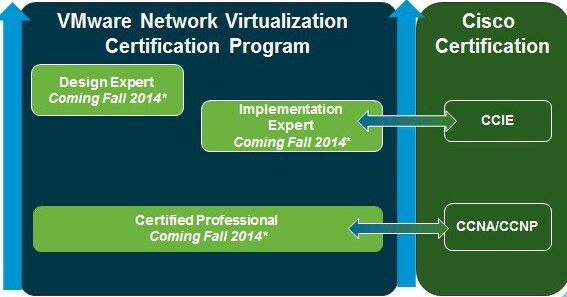 In a previous post I have talked about the expected VCDX program announcements at VMworld 2014. There is now a very strong rumour that the first VCDX-NV candidates will be defending their designs next week. The first batch of newly minted VCDX-NVs will likely be celebrated at the VMworld US – VCDX/vExpert party. This was intimated by the “VCDX-NV” option present in the VCDX/vExpert party registration. Suprisingly, there are no “VCAP-NV Admin or Design” exams at the moment, which are currently required for the other VCDX tracks; there is just a straight jump from Professional to Expert. I wonder if you have to complete VCIX-NV before you can apply for VCDX-NV? I am sure the entire VMware community is very eager to review the blueprints for these new certifications. It will be very interesting to see how vSphere administrators who have been traditionally weak on networking will beef up their skills for the NV track. I have already noticed an increase in CCNA and CCNP study posts amongst VMware bloggers. The “Rise of the Super Architect” has begun. Currently, VMware Education have the “NSX 6.0: Install, Configure and Manage” course available, with the “NSX Fast Track”, “NSX Integration and Design Best Practices” and “NSX Troubleshooting Workshop” courses announced and on the way. Furthermore, the VMware community has been frustrated by the lack of access to the NSX 6.0 binaries for home lab testing. This will soon be rectified for vExperts, where Eric Nielsen announced on VMware Communities Roundtable Podcast #289 that vExperts would be added to the “NSX approved list in the near future”. What really excites me about this isn’t so much the VCDX level cert details, but the addition of a VCIX certification. I’d be thrilled to see this level of certification show up in the other branches, as an alternative for non-design folks like myself. Recommend: VCA x 4, VCP-DCV, then VCAP-DCA, VCAP-DCD after you have a few years of experience. vSphere is the foundation of VMware’s solutions, master that first, then move onto Cloud, Desktop and Network virtualisation.